U.S. Ambassador Power says directly criticizing Israel is "a red line", as Security Council can't agree on statement against Jewish State. 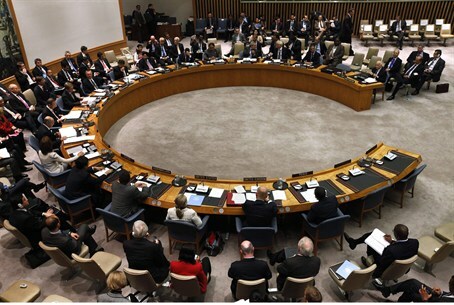 The United Nations Security Council on Monday failed to agree on a statement that would have condemned Israel over the deaths of Palestinian Arabs as part of its security operation in Judea and Samaria, following the kidnapping of three Israeli teenagers by Hamas. Russia's UN Ambassador Vitaly Churkin, the current Security Council president, was quoted by The Associated Press (AP) as having said he proposed the press statement after listening to a Palestinian appeal for council action. He added that one council member wanted stronger language and one didn't want any reference to Israel, so unfortunately the council was not able to find "common ground." Diplomats said Jordan insisted that "deploring" wasn't strong enough and U.S. Ambassador Samantha Power said any language directly criticizing Israel would be "a red line" for the Americans. The diplomats spoke to AP on condition of anonymity. Riyad Mansour, the Palestinian Authority (PA) UN ambassador, said he had delivered a letter to Churkin from the PA leadership demanding that the Security Council "shoulder its responsibility" by "condemning this onslaught against our people and demanding a complete cessation immediately." UN Undersecretary-General for Political Affairs Jeffrey Feltman told the Security Council at an earlier open meeting that the situation on the ground had turned highly volatile following the suspension of peace negotiations in late April and despite initial restraint on both sides. He expressed alarm at the increasing Palestinian Arab death toll in Israeli security operations, saying more than 350 have reportedly been arrested, many injured and four killed. "We condemn all killings of civilians and call for an investigation into any such deaths," Feltman said, according to AP. He also criticized Israel for tightened restrictions on Palestinian Arab movements, the hunger strike by terrorist prisoners, and for "illegal settlement building”, the report said. The debate in the Security Council was held one day after UN Secretary-General Ban Ki-moon expressed “solidarity” with the families of the three kidnapped Israeli teenagers, but also hit out at Israel for arresting Hamas terrorists as part of its operation to locate the three teens. The conversation between Ban and Netanyahu was held several days after a spokesperson for Ban claimed that the UN has no "concrete evidence" that Eyal Yifrah, 19, Naftali Frenkel, 16, and Gilad Sha'ar, 16, were "actually" kidnapped by Hamas terrorists. The timing of the spokesperson’s comments was odd, as they were made after Ban had already condemned the kidnapping, noting particularly that two of the kidnapped Israeli students are minors.